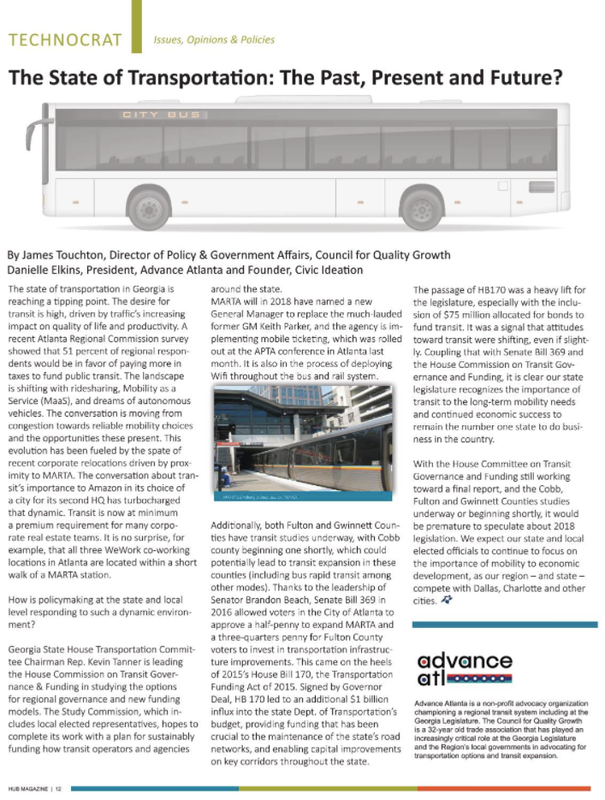 Advance Atlanta was featured in the December 2017 issue of Hub Magazine discussing the state of transportation in Georgia. Check out the full article below or on the digital edition, page 12. Over the past year, we partnered with MIT’s Department of Urban Studies and Planning to examine how open-source, interactive tools might change how stakeholders can meaningfully engage in the public transportation planning process. Alongside Ride New Orleans and Walk San Francisco, Advance Atlanta assessed the usefulness of the CoAXs tool. 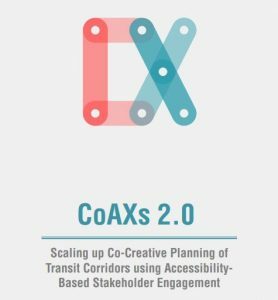 CoAXs (Collaborative Accessibility-Based Stakeholder Engagement for Public Transportation Planning) is an interactive planning tool developed by MIT with the goal of enhancing participation and creative problem solving for planning public transportation systems. Within the tool, users can explore proposed and existing transit routes as well as examine the impact of associated variables such as changing bus speeds or frequencies. Eight proposed Metro Atlanta transportation projects were selected and tested on the platform, giving participants the ability to toggle the projects across 32 distinct potential scenarios. Many of you have no doubt seen a shift in the transit debate over the past few years. As the voting public has developed more favorable views on transit, the traditional partisan argument over whether or not the Atlanta region should pursue transit expansion has largely been replaced with a more substantive conversation over what particular transit modes make the most sense in different areas. Metro Atlanta residents and leaders have come to realize that whether your focus is jobs, or improving access for our aging and transit dependent populations, expansion of our regional network is an absolute necessity. To be sure, there are still some partisan politics in play, but much of that conversation is now centered around examination of current densities and proposed land use in given corridors, and what fiscal constraints particular jurisdictions are dealing with. This is exactly where Fulton County finds itself. After efforts to expand MARTA up the 400 corridor stalled in 2016, Fulton leaders set out to better define what kind of transit would work best for them. Fulton County and its participating cities (all but Atlanta, which voted to increase their transit spending last November) partnered with the Atlanta Regional Commission to complete a comprehensive transit plan. After completing an initial review of each city’s community and economic development strategies, the planning team undertook an extensive round of public input sessions starting this past June. The teams held a total of 26 public input sessions at various locations all around Fulton County. The input gathered at those sessions has helped to inform these preliminary findings. We encourage you to attend the final session, take their survey and check back for updates on the specific recommendations. We will continue to share information, but you can also stay informed by visiting the Fulton County transit master plan page. Additional information on our Website Design Request for Proposal can be found by clicking the link below which provides detailed responses to questions received prior to the formal November 23rd deadline to submit questions. Official responses are due December 7, 2016. The Coalition to Advance Atlanta (Advance Atlanta) is a 501(c)(4) organization working to gather people together to learn about and fight for better transit in the metro Atlanta region. We engage our members by providing access to information on how to get involved in influencing the passage of legislation, passing funding referendums, and helping good development and improvements happen. We believe that together, we can raise the standard of transit in Atlanta. We have received a grant from the American Public Transportation Association’s (APTA) Local Transit Coalition Grant Program to design and develop new features for our website, and we are currently seeking proposals from qualified candidates to complete this work. The purpose of this RFP is to provide a fair evaluation for all candidates and to provide the candidates with the evaluation criteria against which they will be judged. We created our current website at www.advanceatlanta.com in 2015, but we would like to add features to further engage our members, supporters, and partners. This is an open and competitive process. The proposal must contain the signature of a duly authorized officer or agent of the company submitting the proposal. If the execution of work to be performed by your company requires the hiring of sub-contractors you must clearly state this in your proposal. Sub-contractors must be identified and the work they will perform must be defined. Advance Atlanta will negotiate contract terms upon selection. All contracts are subject to review by our legal counsel, and a project will be awarded upon signing of an agreement or contract, which outlines terms, scope, budget and other necessary items. The full Request for Proposal with additional details on Advance Atlanta, our audience, project description, goals/objectives and implementation/imeline can be downloaded here. 62, 66 and 73. 1957, 1996, and 2016. Remember those numbers. To be a transit-enthusiast in metro Atlanta is a position often fraught with disappointment and frustration. It is certainly not for the faint of heart, nor those who are not prepared for a constant, uphill battle. However, from the point of view of this eternal optimist, the tide seems to be turning (as I continue to hold my breath, and furiously “knock on wood”). As a Sandy Springs native, MARTA trains and buses were constants in my childhood, yet only viewed from the window of a car. It was only after four years in Washington, DC that I realized cities were meant to be experienced on foot, bike, bus, or train, and not, as had been my singular experience, behind the wheel of a car from parking lot A to parking lot B. After returning to Atlanta for graduate school in 2011, residing in Midtown was the logical choice in order to maintain the newfound transportation independence and quality of life to which I had grown accustomed. Just take one look at the Atlanta Business Chronicle, or the cranes that dot the skyline, and clearly the business community agrees. Heartbreak after TSPLOST’s defeat in 2012 ultimately led to my involvement with Advance Atlanta, and the 12 other like-minded individuals who comprise our Board of Directors. Our traction with metro Atlanta residents, the business community, civic leaders, and elected officials has been one of the most rewarding experiences of my adult life, ultimately leading to the passage of SB 369 a mere 3 hours prior to the close of the 2016 Georgia General Assembly session (this is complicated work for those of us prone to anxiety). For those unfamiliar, SB 369 offers the City of Atlanta the opportunity to ask its residents for a ½-penny tax increase this November for the purpose of funding a massive expansion of transit within the City limits unlike any this region has seen since MARTA’s inception in the 1970s. Advance Atlanta supported the initial vision of Senator Brandon Beach, SB 313, which would have allowed all of Fulton and DeKalb counties to vote on an even more extensive $8 billion expansion. However, due to obstructionism by an extreme minority of elected officials from North Fulton county (against the evidence of current polling), only the 450,000 residents of the City of Atlanta (as opposed to the approximately 2 million residents of Fulton and DeKalb) will get the historic opportunity for the additional transit we so desperately need and want. Make no mistake, transit expansion inside the city limits will be a complete game changer for what is consistently described as one of most sprawling and poorly designed cities in America. While the project list will not be completely finalized until this summer, it will likely include some combination of light-rail on the BeltLine (which many of us thought was decades away from becoming a reality), the expansion of the Streetcar outside of Downtown, and infill stations on current MARTA lines. Ultimately, the success of this expansion will not only benefit the City of Atlanta, but will strengthen the case for growth into Cobb and Gwinnett counties as density builds and demand increases. Currently, the voices calling for transit outside of the urban core have been drowned out by the naysayers. For the opposition to change their tune, they’ll have to feel the prolonged pain of businesses and residents leaving those communities for a more transit-rich environment (which is already occurring, just not to the degree needed for a complete change in attitude). If you have walked the streets of Midtown and seen the numerous cranes in the sky, driven through Central Perimeter and noticed the Fortune 1000 businesses within a half-mile of MARTA stations, or walked the BeltLine through previously forgotten neighborhoods (which now boast townhomes that cost in the mid- to high six figures), then you understand how connectivity can transform a region. Now, think about what happens to our City when $2.5 billion is invested in the largest expansion of transit since MARTA’s establishment. For those of you who lament that Atlanta is not as easily traversed as cities such as Chicago, San Francisco, or Boston, now is your chance to make a difference. Even if you are not a regular MARTA rider, or even a resident of the City, you have a stake in this. Proximity to transit increases property values, attracts businesses, and injects culture and walkability into a City’s fabric. One of the reasons that I love Atlanta so much is that we do not have a fully formed identity. Unlike the more established Northeastern cities in this country, we are experiencing growing pains, and still coming into our own. To me, that is extremely exciting, and allows residents to have a much more active role in shaping what we will become. This City is a very different place than during my childhood. On all fronts – culture, business, vibrancy, food, music, and art – we are firing on all cylinders like we never have before. The last piece of the puzzle is a more easily navigable community. Mark my words – the best and the brightest will only put up with mediocrity on that front for so long before leaving for greener pastures. We have put up with extreme traffic for so long that we have collective Stockholm Syndrome. This is a wake-up call – easy and healthy transportation options are not a privilege of a select few Northeast and West Coast metropolises – they are human rights, and we need to expect nothing less from our own beloved City. Oh, right, those numbers I mentioned: 62 percent of metro Atlanta views MARTA favorably, 66 percent of Fulton and DeKalb county residents favor dealing with traffic congestion by improving transit, not roads, and a whopping 73 percent would vote for a tax increase to fund transit expansion. In 1957, our airport became the busiest in the world; 1996 is when Atlanta hosted the Centennial Olympic Games; and 2016 is the year that Atlanta takes its next giant leap onto the world’s stage by voting to expand transit this November. If you love this City, and support its continued progress, join the Advance Atlanta movement. Joey Kline is the Treasurer and a Board Member with Advance Atlanta and he is a Commercial Real Estate Broker with Jones Lang LaSalle. http://s3.amazonaws.com/advanceatlanta-wordpress/wp-content/uploads/2017/05/08192940/logo.png 0 0 pklibanoff http://s3.amazonaws.com/advanceatlanta-wordpress/wp-content/uploads/2017/05/08192940/logo.png pklibanoff2016-04-25 20:43:092017-05-11 23:09:1962, 66 and 73. 1957, 1996, and 2016. Remember those numbers. Thank you for your interest in learning more about us. We want to tell you a little more about who we are. Advance Atlanta is a grassroots, citizen-driven coalition working to champion a unified, comprehensive regional transit system for metro Atlanta. We believe in a metro Atlanta region in which our residents are able to get to the places where they live, work, and play efficiently through a top-notch transit system that gets people where they need to go. Our traffic problems have strangled us for years. Traffic congestion has topped the list of residents’ concerns in the Atlanta Regional Commission’s Metro Atlanta Speaks survey for the past two years. Despite the hard work of many people, it’s just the case today that if you want to get most places in metro Atlanta, you can’t do that by hopping on a train, bus, or streetcar and get there in a reasonable amount of time, or at all. If we’re going to overcome the challenges confronting our region, metro Atlanta needs to speak with one voice and make the case in our neighborhoods, in our board rooms, in the media, and to our elected officials that it’s time to address our transportation woes comprehensively throughoutstanding transit access that reflects the outstanding region we call home. Doing so will make our region a more competitive, healthier, and productive place to be. If you’re reading this, you probably agree. We need your help. We need to get the word out that it’s time for all hands to be on deck for transit in metro Atlanta. We need to drill down into the neighborhoods of the metro region and find people who are passionate about their communities and want to make a difference. We’re looking for people who know their neighborhoods and want to serve as community organizers and advocates as well as those who just want to lend their name to an effort through petitions or making a call to legislators. If you’re a business owner, we’d love to have your support. In the months to come, we want to hold grassroots organizing meetings in communities across the region and build a coalition of residents, businesses, and community organizations committed to the vison that if we’re going to advance Atlanta, we need to connect it. Now that you know a little more about us, we want to learn more about you! What are your thoughts on transit in your community? Are you interested in organizing in your community? Please fill out this quick survey. Now’s the time, metro Atlanta. Please share this message with 10+ individuals who may be interested. We look forward to the road ahead together. You can join our newsletter at AdvanceAtlanta.com/connect.